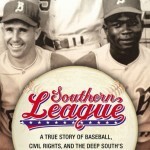 David chats with former baseball player turned author Larry Colton about his new book Southern League: A True Story of Baseball, Civil Rights, and the Deep South’s Most Compelling Pennant Race. Although Major League Baseball integrated in the late 1940s, minor league (Southern League) baseball remained segregated until 1962. This book tells the story of the Birmingham Barons 1964 season and how the Black players were greeted during their first integrated year.